Natalia Stasenko, a registered dietitian, is passionate about pediatric nutrition and shares nutrition tips and coaching on FeedingBytes. Natalia has a Master of Science in Nutrition Education from Columbia University. She co-wrote to books Baby Led Feeding and Real Baby Food with Jenna Helwig. This was originally a 4 week interview series which had since been combined into one informative post. The series was focused on nutrition for toddlers, in particular dealing with picky eaters or children who cannot eat certain foods. It is recommended by the American Academy of Pediatrics to start solids at 6-month old. During the first year, the primary nutrition should still come from milk, preferably breast milk as this is still the best nutrition for infants. Before we get into what to eat, let’s first start with the basic of how much to eat. what portion sizes their children should be eating? Natalia: This is a great question and I get it a lot at my workshops and online classes. Generally speaking, babies start with a very small amount of solids and gradually progress to more solid foods in their diet by the time they turn 12 months. At around 9-10 months many babies go through the “big switch”, as I call it. At this point, more calories and nutrition start coming from solid foods than from formula or breastmilk and many babies want bigger portions of solids and also start snacking on solid food rather than drinking milk or formula for snacks. 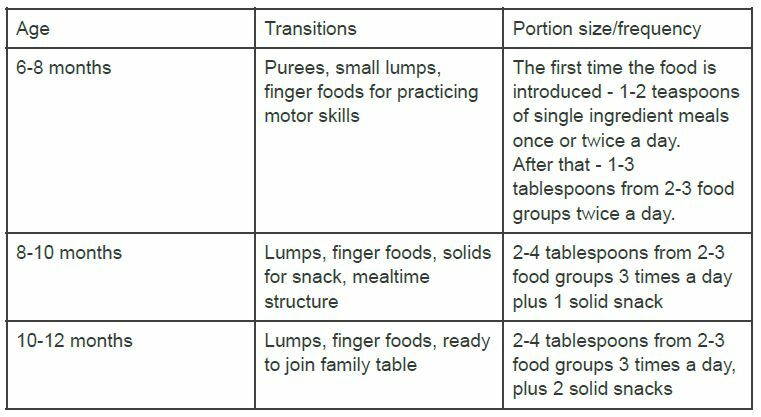 It is important to remember that any guidance on portion sizes for babies can be interpreted only as an estimation, as babies’ appetites vary greatly. What I provide in this chart is more of a “starter” for portions. Some babies need more and some babies need less food. Babies should never be pressured to finish a portion of food or be restricted in the amount they are hungry for. MarcieMom: With regard to picky eaters, I’ve attended a talk by Dr Sears who suggested ‘grazing’, eating small-size food portions throughout the day. Since then, I’ve seen increasing number of articles that recommended it. Would you recommend grazing, and if yes, why and for which groups of children would ‘grazing’ work best? Natalia: Toddlers need to eat more frequently than older kids – every 2 to 3 hours. And serving them snacks in a muffin tray is a great idea! I did it for my own kids and always recommend it in my classes. But I think that the word “grazing” is a little confusing here. Grazing suggests eating small portions throughout the day without any mealtime structure. Dr Sears suggests serving the tray mid-morning and mid-afternoon and I think these are great times for a scheduled snack. Some parents may leave the tray out all day in a hope to get a few extra bites into their toddler. This will most likely result in eating out of boredom and/or no appetite for dinner. Structure in meals and snacks help kids of any ages to eat better at meals and stay attuned to their hunger and fullness signals. MarcieMom: Obesity is a rising problem among kids, actually not just in US but in Singapore as well. I’m thinking that the main meals or snacks which are planned and prepared ahead by parents and caregivers are likely to be ‘correct’. However, some parents (me included!) may slip and offer ice-cream, ice milo, juice (even diluted) and grandparents may offer chocolate-coated snacks (who can resist?!). What is the practical way to look at and control these ‘extras’? Natalia: Those delicious extras can be a legitimate part of your child’s diet. In fact, research shows that it is important to serve your child’s favorites from time to time because kids tend to value restricted foods even more. It is up to parents, of course, to decide how many treats their child will get per day or per week. A good rule of thumb I use with my kids and clients is that anything marketed to children or with added sugar is a treat. To help kids feel in control around “forbidden foods”, we recommend serving them in unlimited amount from time to time (an example will be a glass of milk and a plate of cookies for snack once a month). If served for dessert, the treats should be smaller (think of a size of an oreo cookie) but they should never be served as a reward for eating dinner. Instead, try to serve a small dessert alongside the meal, to “neutralize” it as much as possible. And do not forget that a bowl of fruit with plain yogurt also makes a great dessert! BMI Chart for Portion Control? MarcieMom: A final question on how much to eat – is the BMI-chart for kids accurate or should looking at a kid and assessing whether he/she is all chubby/flabby or look firm and fit be a better gauge? ! Natalia: The most important information we can derive from growth chart is if the child is growing consistently. Some health professionals call it “following the curve”. We aim for comparing the child to himself, not to other children. Some children are consistently on the 90th percentile and completely healthy while others thrive on the 5th percentile. If the child suddenly starts “dropping” or “climbing” percentiles on a growth chart, on the other hand, it may indicate a medical or feeding problem. For the most accurate results, it is also important to pick the right chart. BMI chart is available for kids only 2 years and older and breastfed babies are best assessed on the World Health Organization charts, not the CDC ones. Is the Toddler or the Mom Picking the Food? Come to think of it, the willingness to open one’s mouth, put food in, chew and swallow can’t be forced. So seen in that light, your toddler is the one choosing the food. The problem steps in when he/she is choosing so much, the term ‘picky eater’ soon becomes how you see your child. Natalia has a special interest with helping parents feed picky eaters, given her own parenting experience, let’s find out more from her! What are your top 3 must eat foods that are essential for toddlers, on-top of the standard fruits and vegetables, protein source and carbohydrates? Natalia: I would change the term Must-eat to Must-served. I feel like when parents are under pressure that their child must eat a particular food, children sense it and are more likely to reject it. Which Option to Encourage Healthy Eating on Served Foods? MarcieMom: Assume that the child is refusing to eat the healthier butternut squash, broccoli and fish. What would you recommend a parent to do? In the option(s) you choose or maybe another option or a combination, how long should a parent try a certain tactic? Natalia: I would suggest to keep serving these foods, in the context of family meals, alongside the foods your child has already warmed up to. The biggest mistake parents make is creating pressure at mealtimes in an attempt to get their children to eat particular foods. This does not work. Catering, i.e. giving only the foods that your child likes, also backfires. Non-pressure, pleasant mealtimes, role modeling and plenty of exposure help kids push themselves to learn to like the foods the rest of the family is enjoying. Exposure to less liked foods outside of mealtime through shopping, cooking and taste-testing also works. New ways of cooking may also help. For example, many toddlers dislike texture of meat so in the class we will share a recipe of meatballs cooked in broth that are literally melting in the mouth. When it comes to vegetables, even the simplest of them can be prepared in a variety of ways. For example, you can grate a carrot, cut it into matchsticks, make it into ribbons, steam it, roast it or pan fry it with some butter. We definitely do not suggest starving your child till he eats certain foods. After years of working with children with feeding problems, I know that some of them would rather starve than eat something that is not acceptable to them. Besides, it creates a very negative mealtime dynamics that leads to smaller appetites and ultimately less variety in diet. MarcieMom: Various nutritionists have shared on this blog about inflammatory foods. Would you think this is of concern to young children as well? Which are the top inflammatory foods that you see commonly given to children and should be avoided? Natalia: While we are still learning more from research what exact benefits anti-inflammatory diet brings to adults and children, it is clear that reducing processed foods and boosting fruits, vegetables, lean protein, oily fish and whole grains is a path to good health for both kids and grown ups. However, research shows that an overall dietary pattern seems to be more important than adding or removing specific foods from diet. I often use 80 to 20 ratio in my talks and classes, where 80 percent of food in kids’ diet are minimally processed from the list above and 20 percent are fun foods including treats. That said, I do not think that hydrogenated fats and artificial colors have a place in children’s diet. Of course, eating a blue lollipop or commercially prepared french fries from time to time is not likely to have a big health effect but if parents have an opportunity to choose candy with natural colors or bake french fries at home in the oven, it is great. 80 percent of food in kids’ diet are minimally processed and 20 percent are fun foods including treats. MarcieMom: A final question, how would you grade my ‘food grading’ chart that I use to educate my child? Feel free to shift items around! Natalia: I think it definitely helps to create a balance in the diet, with the focus on more nutritious foods. I think that following a chart like this can help lay down very good foundation for healthy eating habits in the future. However I must say though that as kids are growing up and have more outside influence on their diet from the peers, I had to adjust my feeding strategy to occasionally include “forbidden” foods like soda and cookies. Research shows that kids who are restricted tend to over indulge when they are given access to foods that are forbidden at home. Again, serving the foods you want your child to eat all the time is the key to get them learn to enjoy their flavor, which is the best nutrition education parents can provide. What a Child Cannot Eat due to Allergy, Food Sensitivity or Intolerance? When a parent should suspect there’s a problem with the child after eating the food? When should a parent bring a child in for allergy testing? Natalia: In case with allergic reactions, the typical symptoms to look out for are hives, swelling of the face and mucous membranes found in the nose, ears, lungs and throat, nasal congestion and sneezing, intestinal cramps, vomiting and diarrhea. With smaller kids who cannot talk yet, general discomfort and crying after eating a specific food may also indicate an allergic reaction to food. If your child has any of these symptoms after trying a certain food for the first time, food allergy may be suspected. It is a good idea to call your doctor who will probably refer you to an allergist for a testing. Food allergy is often diagnosed by one of the widely available tests: skin prick test and blood test for antibodies, neither of which gives a 100% guarantee of true clinical reactivity. These tests may be helpful to assist in diagnosing food allergy when the patient history indicates that a specific food may be a problem. A double blind placebo controlled food challenge is considered by this and other reports as a diagnostic “gold standard”. This basically means that a person is given the suspected food once and a placebo another time, without knowing what is what. The challenges are provided in gradually increasing doses and neither the patient nor the practitioner knows in which order they follow, thus patient and clinician biases are removed. Once the offering food is identified, the doctor will likely recommend to remove it from a diet. Children with food allergies may be at a high risk for nutritional deficiencies if important foods like dairy, eggs, or wheat are not replaced by nutritionally optimal alternatives. For example: calorie, protein and fat contents of cow’s milk are much higher than those in most milk substitutes, including almond and rice milk. A child who drinks rice milk instead of cow’s milk may not be growing properly because he or she will not be getting enough nutrients in the diet. Soy milk, on the other hand, is closer in calories, fat and protein to cow’s milk and could be considered a good alternative. MarcieMom: We know that there are certain foods that are the more common food allergens of children, while others are likely to cause intolerance. Given that a food (say fish) has more than one nutrients, how should a parent know what is a suitable replacement food i.e. as long as replacing the main nutrition, say is a protein or replacing the more beneficial nutrients, the omega-3 or finding a food that is as close to fish as possible (but that may trigger the same allergy?). Natalia: It is a great question and I would like to provide some background information. Food allergy is an adverse reaction to protein in food. So every time the allergen is eaten, the immune system starts fighting it using the whole arsenal of chemicals causing the potentially life-threatening symptoms. Food allergy is often confused with food intolerance, which is caused by lack of digestive enzymes, such as lactase in case with milk intolerance. However, food intolerance does not involve immune system. entrocolitis. To complicate matters further, a bunch of adverse food reactions can be both IgE and non-IgE mediated. As you see, there are many different ways we can react to certain foods. To answer your questions, in the case with fish allergy it is more likely to the protein the child is reacting to so the health care provider will probably recommend stay away from all fish and seafood and take a DHA supplement instead. In case of milk intolerance, switching to lactose-free milk will help to avoid the symptoms but if your child. has food allergy to milk i.e. reacting to milk protein, all dairy products lactose free or not, should be avoided. In my private practice I worked with many kids with food allergies who needed a safe and balanced diet to meet their nutrient needs after removing the allergens. In most cases I needed to collaborate with their allergists and pediatricians to create a plan that works for a specific family. What are the top 5 foods that you think under no circumstance a child should be given, or as infrequent as once a month? Natalia: It is hard to ban certain foods from a child’s diet, especially as they become more independent in obtaining their food when they grow up. To avoid vilifying certain foods, that may only increase their appeal in children’s eyes, I prefer to focus on staying away from certain ingredients and buy or make a better version of children’s favorites most of the time. My top 5 food additives to avoid are artificial dyes, artificial sweeteners, sodium nitrate, certain preservatives (BHA and BHT) and trans fats. The good news is that by preparing most of the food at home and reading food labels a family can easily cut on their consumption of these foods. I also believe in watching sugar in kids’ diets because too many sugary foods not only leave less space in small tummies for more nutritious foods but also create real health risks in the future. American Heart Association recommends only 4-5 teaspoons of added sugar per day for children, while most children get 3-4 times the amount. To calculate the amount of sugar in a serving of food, divide the number of grams of sugar on the label into 4, it will give you the number of teaspoons of sugar the food contains. MarcieMom: I’m giving my child supplements – she eats a balanced meal but I think 1. Probiotics, 2. Omega-3 and 3.Multi-vitamins (in doses below 100% of daily requirement) could strengthen her immune system. Is that the right thinking/approach or should I throw these out of the window? Natalia: When it comes to supplements, it helps to remember that it is a very loosely regulated market. FDA controls (somewhat) their safety, not efficacy. In our class we talk about consumer organizations that test and review supplements and I use their input in my work and personal life all the time. I see a lot of multivitamins of supermarket shelves that are mostly sugar and food coloring, missing the nutrients children are most likely to fall short on. So I think it is important to work with a dietitian to choose the supplements your child may truly need. For example, many toddlers do not get enough iron in their diets and at the same time it is missing from most multivitamins. The good news is that there are specific additive and allergen-free comprehensive multivitamin formulas I recommend to parents of picky toddlers but they are not typically sitting on the eye level in supermarket shelves and some may only be purchased online. Back to your question: providing your child with multivitamins, probiotics and DHA may be a good strategy to help close the potential nutrient gaps if your child does not eat many fruit and vegetables, eats no fermented foods and oily fish. But we know that nutrients are best absorbed when they come in the whole package, in foods. So I would still focus on exposing children to the nutritious foods that they are still learning to like, which I feel you are already doing wonderfully! Thank you so much Natalia for being with us and sharing so many nutrition tips!